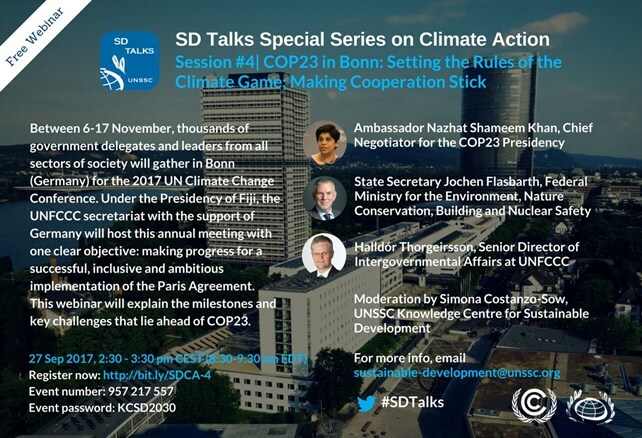 Heading towards COP23: New Webinar from the serie "SD Talks Special Series on Climate Change"
On Wednesday 27 September 2017, a new edition of the SD Talks Special Series on Climate Change will take place and explain the milestones and key challenges that lie ahead of COP23. This SD Talk Special Series on Climate Action is a 7-episode webinar series organised by the UNSSC Knowledge Centre for Sustainable Development in partnership with the United Nations Framework Convention on Climate Change (UNFCCC). On the panel of the live video discussion will be Ambassador Nazhat Shameem Khan, Chief Negotiator for the COP23 Presidency; Jochen Flasbarth, State Secretary at the German Federal Ministry for the Environment; and Halldór Thorgeirsson, UNFCCC Senior Director of Intergovernmental Affairs.